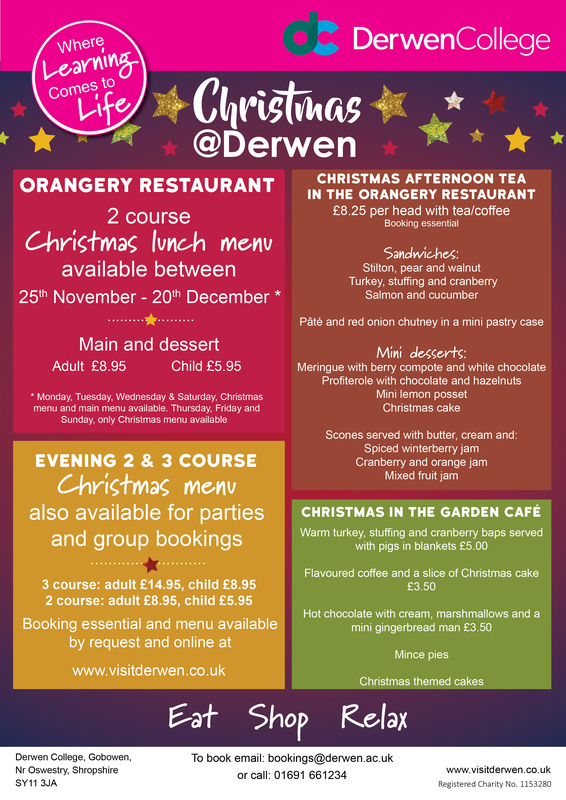 The Orangery Restaurant at Derwen College will be serving a 2 course Christmas lunch menu from 25th November to 20th December. Adult £8.95 and child £5.95 to include a main and a dessert. Evening two and three course Christmas menu also available for group bookings and parties. Menu available on request. Book a Christmas Afternoon Tea in the Orangery Restaurant. £8.25 a head with tea/coffee. Booking essential please. Mince pies and Christmas themed cakes also on offer. They also have a late night opening on 5th December with Christmas activities, festive treats and the Orangery Restaurant is open. 5pm – 7pm. Booking essential please for meals in the Orangery from 5pm – 7pm.